The number of the Syrian refugees from the territories controlled by the Islamic State has increased at the checkpoints located to the north-eastern part of the Aleppo province. 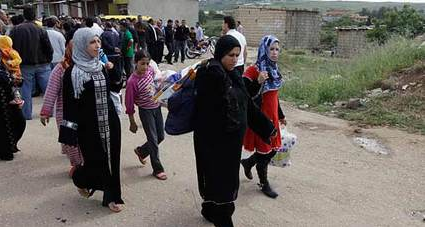 In particular, a group of men of up to 40 people engaged the attention among the refugee stream at the checkpoint near Al Taiarah village, approximately 50 km to the north-east from Aleppo. Most of them answered the questions only in monosyllables. The men claimed they had never had a gun in their hand, but had dug trenches or loaded ammunition under the threat of being shot. “Jihadists forced us to cooperate with them, and in case of disobedience they threatened to cut out the whole family, they whipped to death those who refused to help them,” one refugee states. The representative of the Baath party in Aleppo, Yusef Rana, says that the increase in the number of refugees is primarily due to the extension of the amnesty-law signed by B. Assad up to the end of June. “Many of people decided to take this opportunity and start a new life,” Y. Rana told. He noted that one of the main aims of the local authorities is to make sure that as many people as possible could rectify, correct or improve their previous way of life.